Booklet, 177mm (7 inches) high x 254mm (10 inches) wide, approx. 21 pages, inc. photos of those died and brief histories of all who fell and served. 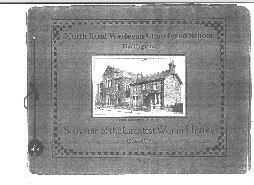 On the front cover is a photograph of the church and school. Souvenir of the Greatest War in History. with gratitude to God, of those who. far reaching, her dominions so wide. nations manhood. What a response! Not unto us. Thine be the glory." is the purpose of this little Souvenir. Died of Wounds, 25th October, 1918.
ferred to Tank Corps, Jan., 1918. Awarded D.C.M. August 22nd, 1918.
transferred to 21st Heavy Battery. the 51st Royal Field Artillery. spine, and died on October 20th. 154th Field Coy., Royal Engineers. on October 6th, 1918, by shell fire. when leading his men into action. 1916, at the Battle of Somme. early part of the war. He was awarded the M.M. He was wounded on Sept.
the Somme, and is still serving. He was wounded in the right arm. boy of 14, in the 2nd D.L.I. Band, and is still serving. torials when war broke out. Rank - 1st Class Writer. shocked, and is still serving. war broke out, on H.M.S. He was discharged to Class W.
in the Machine Gun Corps. in the Royal Naval Air Force. ferred later to the Gloucesters. in the Royal Garrison Artillery. Ministry, and is still serving. Engineers, and is still serving. He was an old soldier. England, first time with I.C.T. lastly wounded in left ankle. the Navy, and is still serving. and has seen much service. in 12th West Riding Regiment. in the Royal Field Artillery. Rank - 2nd Air Mechanic. the Navy, attached to H.M.S. 10 weeks in Hospital, ill.
4th, 1914, and is still serving. spent some time at Dunkirk. illness on July 24th, 1918.
by gun-shot, and is discharged. in the Royal Naval Air Service. Rank - 1st Air Mechanic. seas, and is still serving. ed later to 1st Lincolns. France with the 2nd Yorks. and 2 years in Salonica.